That's right, our favorite "Swingers" are back together again and will be starring in a Favreau developed script titled "Couples Retreat." Variety reports that the duo will be developing and starring in the film for Universal and will be helmed by Peter Billingsley. The feature is on the fast track and will be filmed before Favreau begins production on Iron Man 2 next year (Fav's had to do something to keep himself busy while his star films Sherlock Holmes) with Vince Vaughn producing alongside Scott Stuber in a co-production between his Wild West Picture Show Productions. and Stuber Productions. Jason Bateman and Faizon Love will also star in the film with Jon Favreau and Vince Vaughn. Story follows four couples who go to a tropical island resort. While one couple is there to work on their marriage, the others are there to play but soon discover that participation in the resort’s couples therapy is not optional. No doubt Vaughn will play one of the male's who went on the Retreat for a vacation and not therapy! Thank god Vaughn is back in what sounds like a great and funny role/movie. I don't think I could have handled another Christmas movie with Vaughn! Don't get me wrong, "Four Christmas" does look funny, but two christmas movies in two years and Vaughn is on the fast track to becoming the next Tim Allen (What's next, Vaughn becomes the new toy in Toy Story 3)! I am also very pleased to see Favreau and Vaughn sharing some screen time together again. Anytime those guys are on screen together it is cinematic gold! The concept sounds perfect for what Vaughn and Favreau play to and being produced and written by the duo, it is sure to be a fun retreat! What do you think? 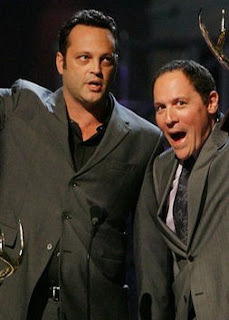 Do you enjoy Vaughn & Favreau on screen together as do I? Does this sound like a funny idea?